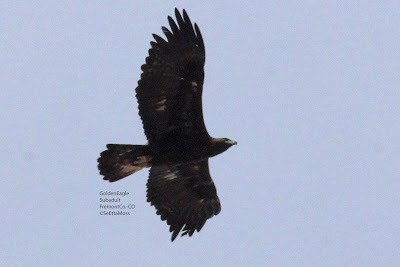 The third apparent Golden Eagle flew in directly at the subadult Golden Eagle. I jumped out of my car and starting shooting these photos showing the sequence of events. Almost immediately the two had their talons locked. Birds of North America (BNA) online notes that when a Golden Eagle is attacked "...often responds by rolling over and presenting talons to the aggressor." That may be what is seen in this first photo. 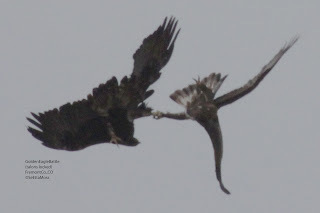 I found another interesting note in BNA online that sounds a lot like what I observed: "However, 2 instances of talon-grappling in Montana both occurred near an eyrie after a “rushing attack” by an adult at an immature...."
In the next several photos the eagles continue with the talons apparently locked together as they appear to battle each other. Now it was getting scary as the eagles had been tumbling together with talons locked. Today I drove to the Holcim Wetlands east of Florence,CO to check on Great Blue Heron nesting. Didn't see any evidence they were refurbishing last years nests or building new ones but spotted some unusual looking 'fly-catchers.' 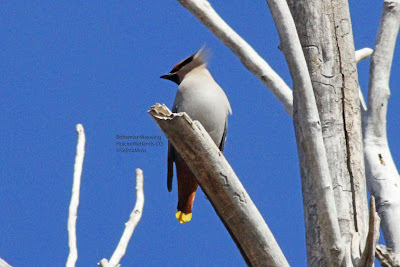 Turned out to be a small flock of about a dozen Bohemian Waxwings sallying out from a dead tree adjacent to the Arkansas River. This irruptive species has been reported about 15 miles north of here in El Paso County in the past several weeks. I had not heard of this before but I have very limited experience with the species. I checked Birds of North America (BNA)online and found the following: "Noted for sallying from exposed perches, often near water, to feed on aerial insect." Exactly what I had observed. 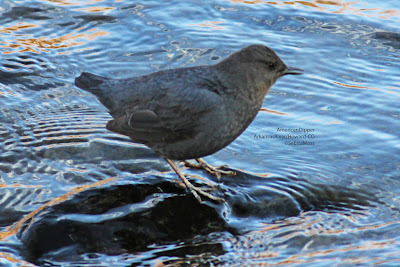 Just as the Bald Eagles are in the Bighorn Canyon to forage along the Arkansas River that runs through this scenic area, so are the American Dippers. I was also disappointed in the low number of dippers I found--only 2. They are usually beginning to nest around now but I saw no evidence of nest building at each of 3 long term nesting locations. And generally they are in pairs by now. Possible reasons could be the ongoing drought which has reduced the Arkansas River to much lower levels than usual or maybe the drought has reduced their food source? It is difficult for them to nest as recreation has increased substantially on this areas of the Arkansas River, both from boaters (most rafted river in U.S.) and fishermen. There were even 3 goldpanners near one of their traditional nest locations today and they get flushed by people so close to the places they nest. During the winter Bald Eagles move south to areas with open water and the Arkansas River through the Bighorn Canyon is always open for at least much of the way even in severe winters. 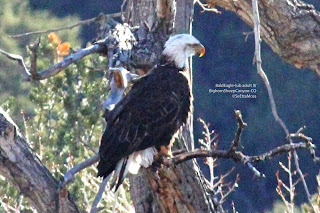 I was disappointed to find only this one Bald Eagle but this is around the time they start migrating back north. Sorry for not getting good close-ups but this eagle was perched about 350 feet away.